With Autumn on the horizon, college football starting in the US this week and NFL football season starting early next month, it's time to start thinking about great tailgating snacks and party food. Whether you're planning big events with lots of guests, small gatherings with just a few friends, a dinner party or just a movie night at home with your sweetheart or BFF, this recipe is sure to please and it's one of the easiest things I've ever made! It takes about 5 or 10 minutes to prepare and only 30 minutes in the oven, so it's a great last minute lifesaver when you need one! 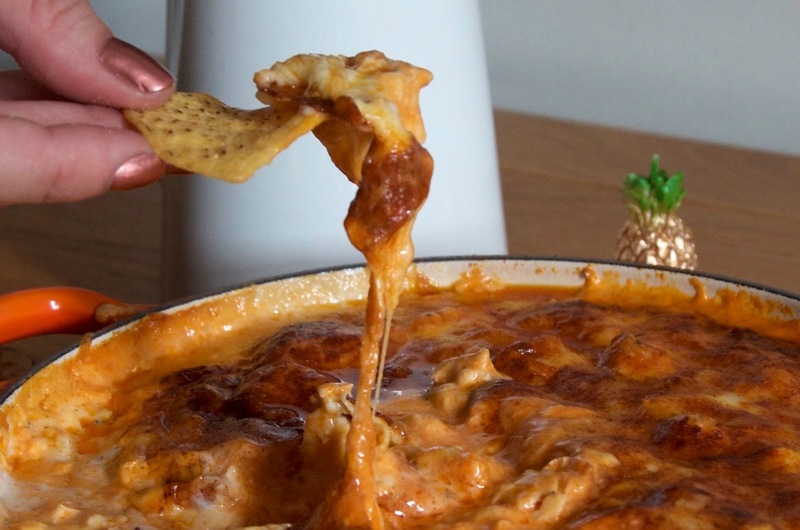 I first had Buffalo Chicken Dip at a friend's birthday party and I loved it, but unfortunately couldn't get the recipe. It was smooth and creamy with chunks of chicken, melted cheese and a kick that could only come from the right amount of buffalo sauce... I later set out on Google to find a recipe and discovered tons of variations - some use blue cheese or blue cheese salad dressing, others use multiple hot sauces and a myriad of multiple cheese options. I set out to make my own version and this is my favorite. 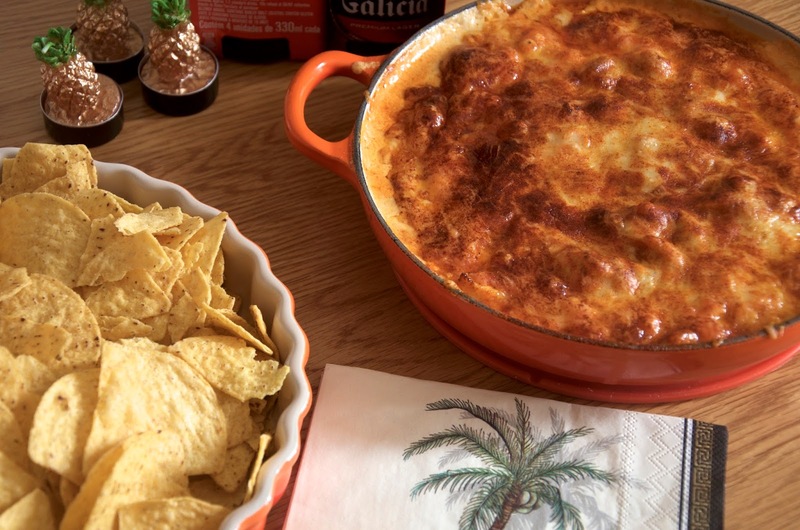 Every time I make my Buffalo Chicken Dip, it's such a crowd pleaser! 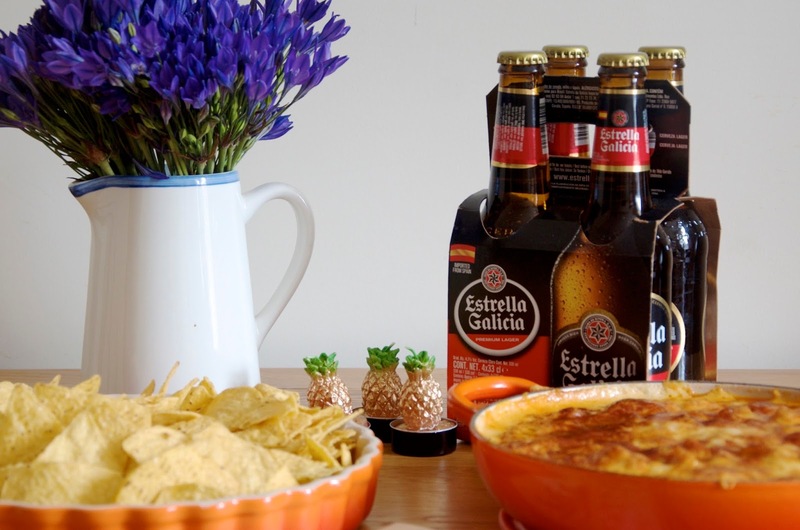 It's the perfect tailgating snack, makes a deliciously low-key starter for a dinner party and is a fun way to feed friends who come over for a visit... There's always something so social about a dip like this and the way that gathering around it seems to inspire a good gossip sesh! 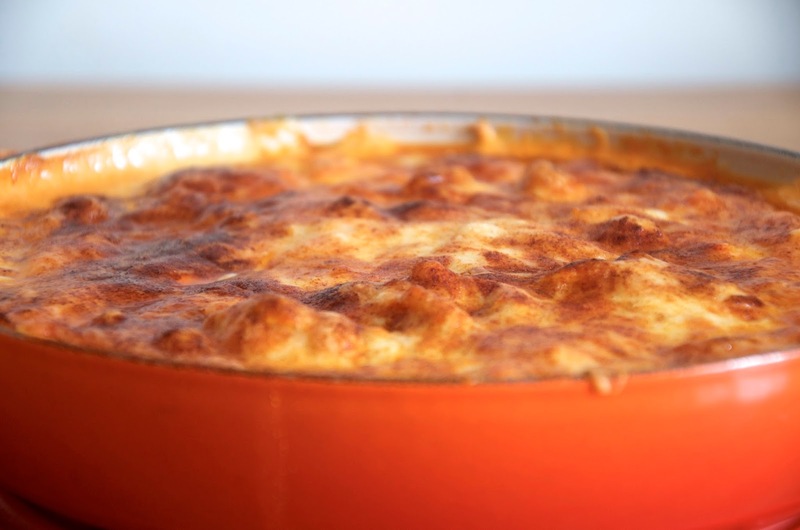 I like to use a round, Le Creuset cast iron casserole dish however if you're looking to spread it out a bit, you could use multiple smaller casseroles or even gratin dishes. Something else worth noting is that this is best served hot and melty, but if you're lucky enough to have leftovers, I also love it cold the next day! As for the ingredients, I like to use light cream cheese, but you can feel free to use whatever variety you like. I also buy chicken that's already cooked which makes this basically the easiest dish ever to whip up with very little time or effort. Furthermore, the below measurements are simply a guide... 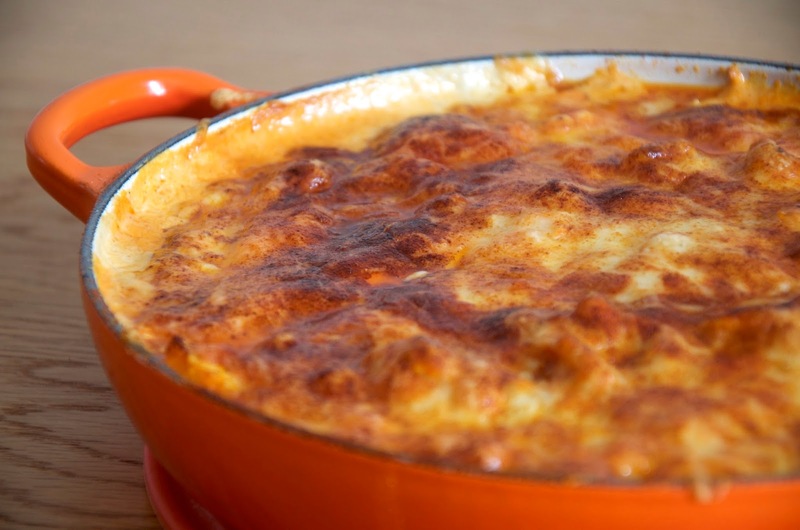 If you want to use more or less of something, go for it, but this is how I like the dip and I think there's a nice balance of spicy buffalo sauce, cooling ranch dressing, sharp cheddar, rich cream cheese and chicken for texture. 1. Preheat oven to 200°C and lightly spray a shallow casserole dish (or whatever dish(es) you decide to use) with non-stick cooking spray (optional). 2. Using a rubber spatula, spread the cream cheese evenly across the bottom of the pan. 3. Sprinkle the cooked chicken over the cream cheese. 4. Pour over the ranch dressing, followed by the buffalo sauce. 5. Sprinkle a little salt (if desired) and give a good grinding of fresh black pepper over the top. 6. Sprinkle the cheddar cheese over top the whole thing and finish with a sprinkling of smoked paprika. I like to put about a tablespoon of smoked paprika into a small sieve and sprinkle it over, but you can use your fingers if you need to. 7. Finally, bake for 30 minutes or until cheese is melted and starting to blister a bit. Serve immediately with tortilla chips, sliced baguette and/or celery sticks. 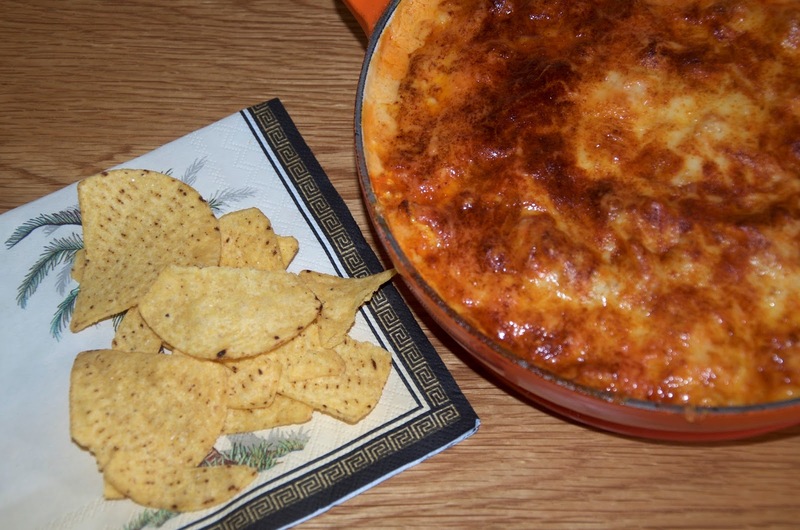 Buffalo Chicken Dip is best enjoyed with an ice cold drink. I recommend Estrella Galicia or a frosty glass of my Best Ever Margaritas with a salted rim instead of sugared! Click here for the recipe.